Moto G7 vs Moto G7 Power vs Moto G7 Play vs Moto G7 Plus: Full Specifications and which one to buy? Motorola recently launched one of its most anticipated G7 series of smartphones for the tech year including which includes the Moto G7, Moto G7 Power, Moto G7 Play and Moto G7 Plus. So, you have complete four set of smartphones to choose from for your next buy, but which would you be going for? Having lost majority of the tech market to competitors, it's no doubt that Motorola’s G series is set to feature strong set of specs and deliver good performance at an affordable price in order to win back those trust once again. An all newer (& better) design with inclusion of a notch and an improved camera set up along with improvements to the internals, no doubt the Moto G7 series will continue the legacy and lives up to the expectations. The Moto G7 is the main flagship out of the four. The Moto G7 Plus is the most expensive, while the Moto G7 Play is the least expensive device. The Moto G7 Play albeit the least expensive of the crop features a Max Vision screen with HD+ resolution of 720×1512 pixels and spots a wide notch at the top. While the Moto G7 Power also has a wide notch at the top and features a slightly bigger 6.2-inch display with HD+ (720×1520 pixels) resolution, the Moto G7 and Moto G7 Plus sport the same 6.24-inch full-HD+ (1080×2270 pixels) Max Vision display with a small water drop shaped notch at the top. However, all four devices bear a chin with the Motorola’s branding at the bottom, but the same gets thinner with the top variant i.e. Moto G7 Plus. In terms of choice of processor, it is as much a coincidence that the Moto G7, Moto G7 Power and Moto G7 Play are all powered by Qualcomm’s Snapdragon 632 SoC clocked at 1.8GHz, whereas the Moto G7 Plus gets a more powerful Snapdragon 636 processor. A penny for the price tag? All four phones are of the same software as they run all run Google’s latest Android 9.0 Pie operating system out of the box along with some custom Moto features like Moto Display and Moto Actions. However, Moto G7 Power is the winner in the battery department as it is backed by an impressive 5,000mAh capacity battery. On the other hand, the Moto G7, Moto G7 Plus and Moto G7 Play pack a 3,000mAh capacity battery. All the phones, except for the Moto G7 Play, come with support for 15W TurboCharger. The Moto G7 Play comes with a 10W Rapid Charger. Unarguably the pick of the bunch when it comes to making choice of smartphones. The G7 Play and G7 Power comes through with a mammoth 12-megapixel single rear camera. Whereas the G7 and G7 Plus get a dual camera set up on the back. The Moto G7 features a 12-megapixel primary sensor + a 5-megapixel secondary rear sensor, while the Moto G7 Plus gets 16-megapixel primary sensor + a 5-megapixel secondary rear sensor along with Optical Image Stabilisation (OIS). For selfies, the Moto G7, G7 Play and G7 Power get an 8-megapixel snapper on the front. The Moto G7 Plus gets a slightly better 12-megapixel shooter on the front with an f/2.0 aperture lens. Without a doubt, Moto G7 Plus seems to have an edge over the other three devices in the camera department. Motorola would not pack in nice features like this as still make these smartphones a $100 driver. 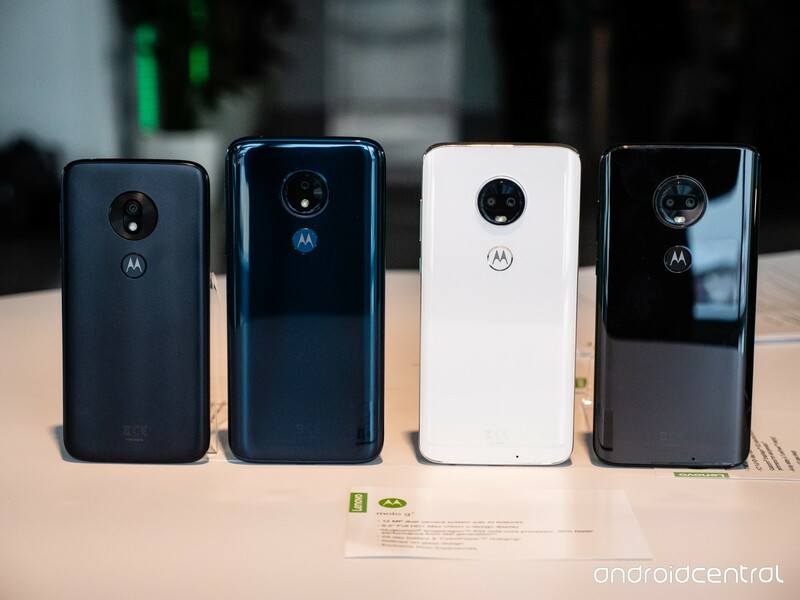 However, the four smartphones is still a budget force to reckon with their pocket-friendly price tag with the Moto G7 Play the most affordable of them all with a price tag of $199 which roughly translates to Rs. 14,250. Next in line is the Moto G7 Power which is priced at $249 i.e. roughly Rs. 18,000. The Moto G7 comes with a price tag of $299 which is roughly Rs. 21,400 and the Moto G7 Plus gets a price tag of EUR 299 i.e. approximately Rs. 24,500. However, the Moto G7 Plus will only be sold in select regions. Top malls in Nigeria are yet to get a hands-on on the devices albeit with Motorola not a popular pick in the country, but it will arrive in India in the coming weeks along with other global markets. Motorola's 2019 Moto G series does justify the hype it garnered by some miles and quite lives up to the expectations as it offers a whole bunch of budget possibilities on the go. Although they lack IP rating, they offer some level of water resistance against sudden splashes. (Do not submerge them in water though!). If you want trendy looks, then you can pick either Moto G7 or Moto G7 Plus as they feature the trendy water-drop shaped notch instead of the conventional wide notch. They also have a smaller chin as compared to the Moto G7 Power and Moto G7 Play. If battery back-up is your key component in a smartphone, then you should opt for Mot G7 Play, thanks to its massive 5,000mAh battery which is expected to give a better run time as compared to the 3,000mAh battery powering the other three devices. If you have a constrained budget, then you should go for Moto G7 Play as it is the most pocket-friendly device of the four. Are you a Camera and selfie-centric freak, the Moto G7 Plus seems to have more to offer as compared to the other four phones (at least on paper). But we recommend you referring to actual user reviews before you make a purchase decision that is based on camera output. Motorola would never be of the objective to confuse its market with radical specs but with the lay down above, we hope you are able to make the right choice when going for either the Moto G7 Play, G7 Plus, G7 Power or the flagship Moto G7. Have any questions or possible reviews to share? Let us know in the comment section. Where to buy the new Moto G7 smartphones & Cases. Trillionclues - Technology Market | Review | DIY Guides: Moto G7 vs Moto G7 Power vs Moto G7 Play vs Moto G7 Plus: Full Specifications and which one to buy?